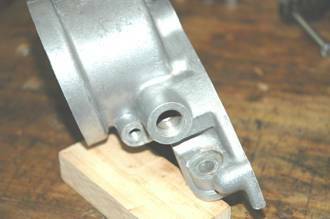 Modified oil pump, showing larger delivery pipe assembly. Our thanks to the Jowett Car Club of New Zealand and, particularly to Neil Moore of that club, for making this useful modification available to us. Compiled by Mike Allfrey – January, 2007. These notes have been prepared using information sourced from the Jowett Car Club of New Zealand. 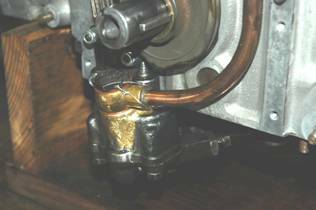 The modifications described herein are designed to bring an early style oil pump to, as close as possible, the final specification of oil pump used in the Jowett Series III engine. These changes have not been designed to increase engine performance, although they do influence the durability aspect to some degree. The pressure release valve spool wears at the valve bore in the housing. The brass body can bend due to the weight of the oil pick-up assembly. The shorter pump element gears and corresponding body are not as efficient as the later type pumps. 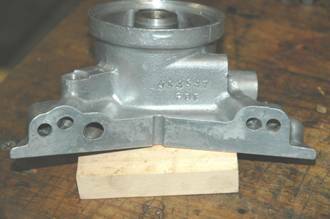 The pump element gears cause wear at the pump cover and become less efficient. The next style pump has the longer pump element gears and body to match them. The gears have two part numbers, 52347 and 52348 The pump cover was made from cast iron and it also was equipped with a non-adjustable relief valve. This pump carried over the same size suction and delivery pipes as previously. The pump body was lengthened to bring the pumping element portion closer to the engine oil level for quicker oil pick-up. The oil pressure release valve featured a larger diameter spring. 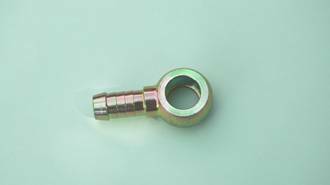 The oil pressure release valve was adjustable, using a threaded spring cap with a lock nut. The diameter of the suction pipe was increased. The delivery pipe’s diameter was increased. The deeper pump body required a longer drive spindle. The deeper pump body required a longer Idler spindle. It is commonly believed that the Series III oil pump was equipped with longer pump element gears – this is most certainly not the case. A number of both later style oil pumps can be found with a pair of drive-gear pumping element gears. 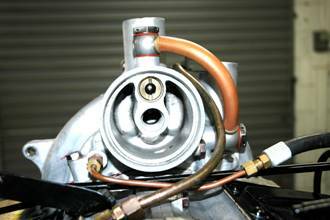 The Jowett engine oil pumps can best be described here as Types I, II and III. These identifying types have been used in these notes for convenience. The subject of these Technical Notes is to describe the modifications to the Type II pump and its delivery system. It should be appreciated that the engine, for which the pump is being modified, should be completely dismantled so that these modifications, which will only work if the crankcase and rear timing cover are also modified, it is the total modification that works in harmony. 1. The pump must be completely dismantled and properly washed before work commences. 2. Using the bronze welding process, build up the oil pump body in the area forward of the delivery pipe banjo threaded hole. NOTE: This area has to be built up sufficiently to accommodate a suitable sealing washer. 3. 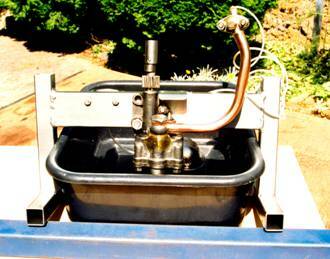 Set the oil pump body up in a milling machine and, using the ½” threaded hole as a pilot, spot face the seal washer seat area. Drill the hole out to tapping size for either the Jowett 5/8” thread, or to take a 16 mm thread. This depends on the banjo bolt being used. Check the thread pitch on the banjo bolt being used. 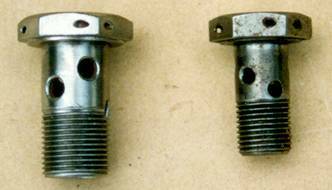 NOTE: Jowett Cars Limited used a non-standard thread pitch for the larger banjo bolt. The New Zealand club have had a tap specially made for this purpose. 4. Trial fit the delivery pipe banjo, sealing washers and bolt to check that the bottom of the bolt can not possibly clash with the pump element gears. 5. If a clash condition exists, the banjo bolt will require shortening in a lathe. 6. Drill locking wire holes through the corners of the banjo bolt’s hexagon. Remove any burrs. 7. Cut the suction pipe away from the cover plate. 8. Drill out the cover plate to snugly accept the larger diameter suction pipe. This should be of 5/8” nominal bore. 9. Make sure that all hacksaw and drilling burrs are removed. 10. Cut the suction pipe out of the strainer assembly. 11. While the new pipe is still straight, set up in a milling machine and mill a larger intake slot as per the original pipe. Weld a blanking plate over the end. 12. Bend a new steel suction pipe so that it holds the strainer approximately 8 mm above the inside face of the engine oil sump. 13. Using the bronze welding technique, tack weld the components together and, if necessary, fine tune them into position. Complete the welding process. NOTE: After welding it is advisable to ensure that the joints are sound and no air can be sucked in. 14. If required, install a new strainer gauze. 15. Out of 3/8” nominal bore copper tube, form an elbow with a minimal radius, but keeping the inner bore cross sectional area. 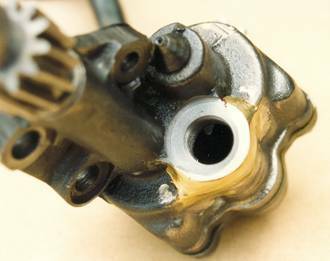 This elbow is positioned over the excess oil exhaust port and should direct the return to sump oil rearwards below normal oil level. 16. The elbow should be silver soldered directly over the exhaust port. 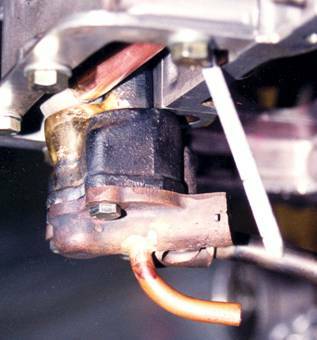 Care should be taken to ensure that no solder enters the oil pressure release spool bore. The spool should be checked for free travel along its entire bore in the cover. 17. Thoroughly was the cover and filter assembly. 18. Check that the pump body contact surface is perfectly flat. If any distortion has taken place, surface grind the surface absolutely flat. 19. Wash the cover assembly, the release valve spool, spring and its keeper. Lubricate the parts with clean engine oil. Assemble these components into the cover and fasten with a hardened split pin. 20. Place the assembly in a plastic bag for storage. Figure 2: A steel banjo fitting. 21. When improvements are made to the suction side of the oil pump, they have to be followed on the delivery side. This can be done quite easily by using a ½” bore (nominal) copper tube. A larger banjo fitting, as shown in Figure 2, can be obtained from a supplier of hydraulic fittings. Modern Banjos come with hose barbs and are made from steel that has been zinc plated. 22. Cut the barbs off at the banjo outlet boss. 23. Enlarge the outlet bore to 11 mm diameter. 24. The copper tube should fit over the outlet boss. 25. Remove the original delivery pipe from the oil delivery elbow. 26. Drill out the inlet and outlet passages to provide an 11 mm diameter oil passage through the elbow. 27. Make sure that the copper tube fits over the inlet boss of the elbow. 28. Bolt the elbow to the front of the crankcase. 29. Install the modified oil pump body on to the crankcase. Make sure that it is in its fully home position on both dowels. 30. Bend the annealed copper tube to follow the shape of the original delivery pipe, and so that the new pipe sits close to the front face of the crankcase. The new pipe should be fitted over the bosses on the banjo and the delivery elbow. NOTE: Caution needs to be taken – the very early engines had delivery elbows that had different bolt orientation. Make sure the pipe is being fabricated on the same style crankcase as that being used for the modified pump assembly. 31. Make sure that the banjo fitting at the pump is mounted on its sealing washer and the bolt is tight. 32. Before silver soldering the two joints, ensure that there is clearance for the timing chain. The final lay of the pipe should be the sane as shown on the front cover of this booklet. 33. Once the pipe and fittings have been silver soldered, the assembly should be allowed to cool. The pipe assembly can then be removed and tested for leaks using water and compressed air. Check also that the jet orifice, that directs oil to the timing chain, is still clear. 34. The pipe assembly should be thoroughly washed and have any soldering flux residue removed. 35. Drill the inlet gallery to 11 mm diameter. This is a straightforward 90° to the face drilling exercise. Do not drill deeper into the crankcase. 36. 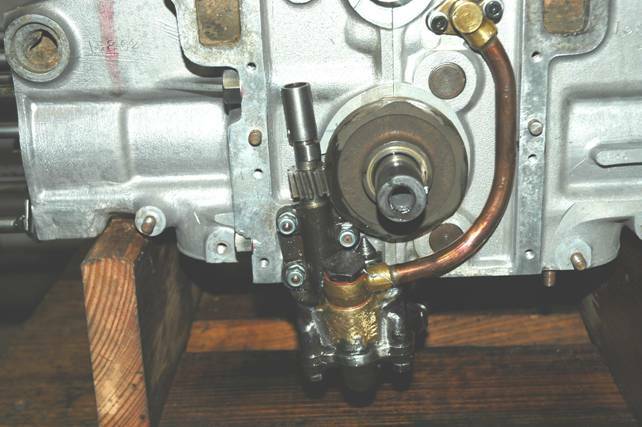 Set the crankcase half up on the drilling table so that a drill the size of the original outlet to the filter gallery passes, freely up and down as the handle of the drill is actuated. Remove this drill from the chuck and install an 11 mm diameter drill. NOTE: Because the drilling is at an angle to the surface of the crankcase, where the rear timing cover sits, it is advisable to use a short drill, It is a good idea to have a larger diameter centre-drill ground to 11 mm diameter to achieve a rigid drill bit for this operation. 37. Using the same method, the two galleries that enter the longitudinal galleries, can be enlarged to 8 mm diameter. NOTE: Extreme care needs to be taken here. There is a possibility that these drillings are very close to the attaching setscrew threaded holes. If this is the case, the galleries can be counter-bored and aluminium plugs pressed in The centres for the galleries can be marked out further away from the threaded holes and then re-drilled with an 8 mm diameter drill. 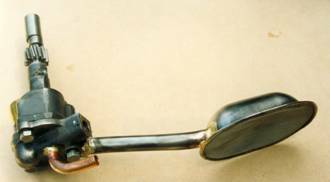 During the Jowett engine’s production life, there were three different rear timing covers. The earlier filter, known as the Vokes oil filter is easiest identified by the green canister it uses. This, Type I filter assembly filters the oil by having it pass through the felt element from the inside to the outside. The Type II rear timing cover was an updated system that featured a ‘blocked filter by-pass valve’ and the filtration was manufactured by Tecalemit. This type rear timing cover can be easily identified by the two ports that supply engine oil to an oil cooler. The filter medium in this filter is paper and the oil passes through from the outside through the paper into the centre of the element. The Type III rear timing cover is essentially the same as the Type II. The only difference being that the oil galleries are larger and the oil cooler ports are also larger. This version, obviously, does not require modification to match those discussed for the pump and crankcase. 38. The rear timing cover should be completely dismantled, that includes removal of the blocked filter by-pass valve. 39. Great care has to be adopted when opening out the oil galleries in the cover. Figure 3: The oil galleries to be enlarged. 40. In Figure 3. the galleries adjacent to the fixing setscrew holes should be opened out to 8 mm diameter. To do this, carefully set the housing up on a drill press table so that a drill the same size as the original oil gallery diameter, mounted in the drill chuck, passes freely in and out of the gallery bore. This drill should not bind as it travels down into the bore. Remove this drill and insert an 8 mm drill to carefully bore the gallery. NOTE: Feed the drill slowly. Do not be tempted to increase the depth of the bore. 41. Repeat this process with the drilling adjacent to the other fixing hole. 42. Set the housing up on the table so that the large oil gallery can be drilled, using the same procedure, as described in Step 40, to 11 mm diameter. 43. Using a beam of light, check that the drilling process has not broken through the gallery walls. Figure 4: Larger diameter return from filter port. 43. Mount the cover on the drill table so that the return, from oil cooler, port and gallery can be drilled. NOTE: Drill the actual gallery out to 8 mm diameter using the same procedure as described in Step 40. The drill for this operation may need to be of the long-series type. DO NOT deepen this gallery. 44. Enlarge the banjo bolt drilling so that a thread can be tapped for a 16 mm banjo bolt. 45. Inspect the drilling with a beam of light to check if the drill has broken through the gallery wall. Figure 5: Showing the enlarged outlet port. 46. Mount the cover on the drill press table so that the out, to oil cooler, port and gallery can be enlarged. The thread should be the same as described in Step 44. NOTE: Take care when the drill breaks through into the horizontal gallery. Do not drill deeper. That completes the oil gallery and port enlargement process. If there is an instance of oil gallery break-through the outer wall should be built up using the aluminium Tig-welding process. The welded gallery should then be carefully re-drilled to clean up any weld that may have penetrated. It is not really advisable to modify the Type I (Vokes) oil filter housing, because there is not a great amount of wall thickness to permit enlargement of the galleries. It is best to restrict modification to the Type II rear timing cover only. It is understood that these were fitted to engines with the PD prefix in the serial number. There is a train of thought that considers the finish of the oil galleries as being of utmost importance. The gallery walls must be as smooth as possible and without any burrs that could be dislodged. Hence the call for slow feeding of the drill during the drilling operation. Another consideration that is deemed important is that of the gallery end profile. It is judged that the gallery end should be finished with a radiused-end cutter in favour of the normal drill cutting edge angle. This does require extra tooling, but can be beneficial in terms of oil flow dynamics. Figure 6: Showing an installed oil transfer pipe. a) If the engine has been fitted with a Series III front timing cover. 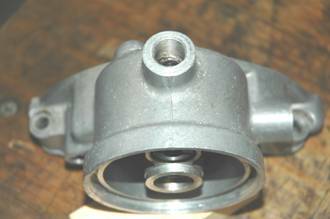 If so, allowance must be provided to let the formed pipe clear the rear distributor mounting lug on the timing cover. b) The breather pipe assembly may require careful bending to allow for the larger diameter oil transfer pipe to clear it. See Figure 6. 47. Use the same diameter copper tube as for the oil pump delivery pipe. 48. Use the same banjo fittings (Figure 2.) as for the oil pump delivery pipe. 49. Cut the hose barbs off the banjo fittings and drill out inlet ports to 11 mm diameter. Clean up any burrs that may be present. 50. Mount the banjo fittings on the rear timing cover ports with banjo bolts and sealing washers. Make sure that the top fitting exits towards the RHS, but angled towards the rear slightly. Make sure that the side mounted fitting exits towards the top, but is also angled slightly towards the rear. 51. 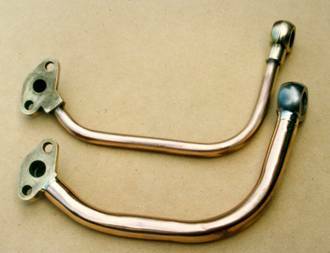 Form the copper tube so that it forms a graceful curve rearwards and sits over the bosses on the banjo fittings. NOTE: Make sure that the oil transfer pipe will not foul the engine oil filter canister. See figure 6. 52. Silver solder the joints so that they are strong and oil tight. Test with compressed air, while the pipe is immersed in water. 53. For appearance, the oil transfer pipe can be polished and treated with a clear lacquer. 54. Measure the oil passage holes in the banjo bolts and enlarge to provide the same, in total, cross sectional area as the pipe work they are used for. Enlarge these holes if possible. 56. It is a good idea to use 16 mm Dowty washers at all of the banjo fittings. A Dowty washer features a lipped seal bonded to its inner diameter. These washers, used on smooth surfaces, form an oil tight seal without requiring excessive torque values at the banjo bolts. This is a particularly useful feature if the oil passages in the banjo bolts have been enlarged. 57 Mount the oil pump assembly on to a suitable test stand. 58. Connect the delivery pipe to an oil pressure gauge. 59. Fill a tub with SAE 30 engine oil, so that it fully covers the intake filter housing. 60. Use a cut off end of a distributor drive shaft set in the chuck of a reversible electric drill. The drill should, ideally, be of the variable speed type. 61. Set the drill speed to high ratio, and to run in anti-clockwise direction. 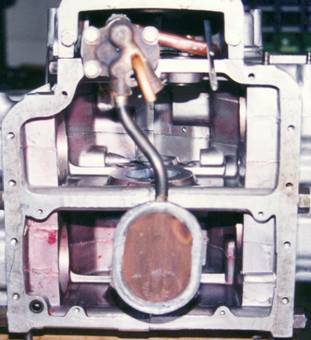 Figure 7: Oil pump test rig. 62. Hold the drill firmly, but with some flexibility, so that once the speed is increased the drill assumes, in the hands, a steady attitude and does not try to orbit. Gradually bring up the speed until the drill is operating at maximum speed. NOTE: This is were it gets messy. As oil is sucked in and delivered under pressure, there will be jets of oil at the delivery elbow and from the top of the idler element spindle. These jets are there to lubricate the timing chain and the oil pump drive gear. The latest version of the test rig has built in deflectors to direct the jets back into the oil container. 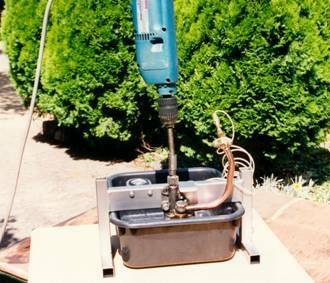 Figure 8: Showing the electric drill drive. 63. The oil pressure should read 60 – 75 psi. If the pressure is low, it can be increased by installing shims under the spring. Such shims are not a stocked item, and therefore will need to be made. If the pressure is too high, a small portion of the spring can be ground off carefully. Setting the pressure is a trial and error procedure. 64. If the pump cover features an adjustable release valve – screw the adjuster inwards to increase pressure, and outwards to decrease the pressure. Lock up the jam nut each time an adjustment is made. Recheck the pressure each time. 66. It should be noted that 2,000 rpm at the drill represents 4,000 crankshaft rpm. Figure 9: Comparison of larger banjo bolt. Figure 10: Shows difference in bore size. Figure 11: Illustrates built up pump body. Figure 12: Illustrates difference in delivery pipes. Note the smooth bend of the copper tube and how it fits over the banjo fitting and the delivery elbow. Note the larger diameter pick up pipe and the oil return elbow. The added material to the pump body can just be seen at left. Figure 14: Trial assembly to a crankcase set. Figure 15: Return elbow position. Note that the elbow exits well below the bottom of the dipstick.